Lower Back Pain is so common that its estimated that 80% of adults will experience it during their lifetime. At least 25% have experienced low back pain in the last three months. Both men and women are equally prone to have problems with their lower back and be in need of effective pain relief. Caron Chiropractic Clinic, P.A. has several Corrective Treatment Options available to our St. Paul, MN patients. Our non-invasive techniques provide beneficial health results and pain management without the use of surgery. 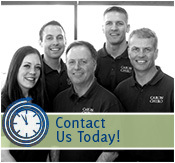 The Licensed Chiropractors at Caron Chiropractic Clinic, P.A. have successfully treated lower back pain for about 20 years. Corrective treatment options vary depending on the underlying cause of the low back pain. The first step is to properly diagnose the problem and then to begin effective pain management techniques. Beneficial Health Results have often been found through hands-on chiropractic care such as spinal adjustments. Other pain management and healing therapies may include massage therapy, laser therapy and rehabilitative exercises. Each of these therapeutic strategies has been an effective treatment for pain relief from acute and chronic lower back pain. Caron Chiropractic Clinic, P.A. is a leader in Corrective Treatment Options for lower back pain relief. We offer effective hands-on chiropractic treatments that provide beneficial health results and greater pain management. Our patients have experienced pain relief and an improved quality of life. This entry was posted	on Thursday, January 1st, 2015 at 9:21 pm	and is filed under Back Pain, Chiropractic Treatments. You can follow any responses to this entry through the RSS 2.0 feed. You can leave a response, or trackback from your own site.